The internet has made it possible for people to learn and do things that they might not have been able to do otherwise. It also provides consumers with a means for purchasing everything from the latest high-tech gadgets to auto parts and tools. However, while online purchasing can be great for finding hard-to-get replacement parts and items, there are still many advantages associated with searching for an “auto parts store near me” right here in Southeastern Massachusetts. 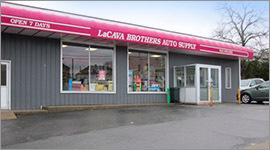 For example, LaCava Auto Supply in Fall River has proudly served locals for over 70 years. We work with professionals and individual car owners alike, delivering top quality parts, fluids, accessories, and services at our local shop. We carry a vast inventory of parts and accessories, but we can also get items for you from our supplier catalogs for special orders. Some of the brands that we work with include AC Delco, CRP, Denso, Delphi, Fel-Pro, Gates, Moog, Motorcraft, Monroe, Pennzoil, Timken, Wagner, Walker, and Wix. We have all of the parts you need to complete repairs and installations for belts and hoses, engine parts and mounts, valvetrain and transmission, water pumps, sensors, electrical and wiring. We also carry alternators and starters, A/C replacement parts, plus everything you need for brakes, drums, rotors, and calipers. Our shop carries parts for chassis, emissions, fuel-related issues, and a wide range of shocks, struts, and springs. LaCava auto parts has top quality performance parts, fluids, and filters – everything you need for DIY auto repair or professional repair services. We are proud to provide Fall River, MA car parts to commercial repair shops, ensuring that our customers have everything they need for minor and major automotive work. From tune-ups to complete overhauls, we have everything in-stock that you need to get the job done. Don’t waste your time ordering items online that may take several days or weeks to arrive when you can stop by LaCava Auto Supply in Fall River and walk out the door with everything in hand. Another common issue associated with online purchases is paying good money for a part, waiting weeks for it to arrive, and then getting it only to discover that it is the wrong part and won’t work at all. Then you have to contact the company, go to the post office to ship it out, and hopefully get your money back. Meanwhile, you still need the part to finish your auto repair or project. 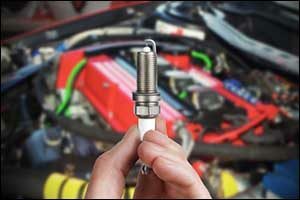 LaCava Auto Parts can help you get the right part for your vehicle. If we don’t have it in stock, we can help you place an order for a special item. We can even deliver parts to you direct if you are located in the Greater Fall River area. We have great prices, excellent customer service, and have earned a solid reputation for providing top quality products and services at our local Fall River, MA car parts store. With LaCava Auto Supply in Fall River, you can start your search online and pick up the parts you need in-store. We are committed to providing automotive supply companies, auto body shops, and consumers with access to lookup parts in an easy and convenient way. Use our Nexpart Part Lookup tool on our website to start your search for the parts you need from the comfort of your home or office. Just have the year, make and model ready to start searching for parts using our Parts Lookup Tool. If you have any questions about the parts or placing an order through our store or extensive list of manufacturer catalogs. Make sure to ask about local delivery options to help you get your parts as quickly as possible. Perhaps the most important reason to shop local and find an “auto parts store near me” when searching for the best place to buy parts, accessories, and tools is working with friendly, knowledgeable, and experienced auto supply in Fall River. If you need quality parts and want to ensure that you get what you are paying for, stop by LaCava Auto Parts. Since 1942 we have proudly served the Greater Fall River community, providing a full line of both foreign and domestic parts. We serve commercial businesses, professional repair shops, and personal accounts and our team is eager to assist each customer with top-notch service that you won’t find anywhere else. In addition to parts we also have a huge selection of tools in stock and offer FREE delivery in the Fall River area. Give us a call at 508-676-1951 or stop by our location on Bedford Street in Fall River, MA.